Forget Valentine's Day. We heard on the radio that Christmas is the most romantic time of the year. 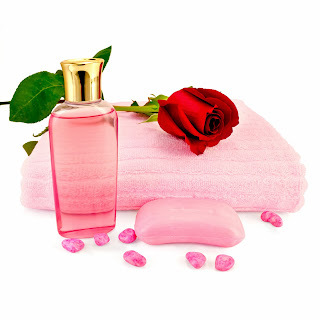 Today's photo then focusses on that with pink toiletries, towels, petals and a lovely red rose. 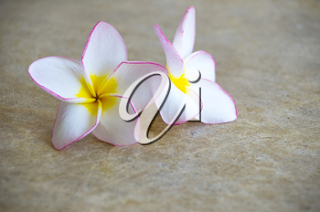 As our Northern American world turns white under a blanket of snow we look to the tropical climates for pretty flowers. Today's photo is a closeup of a beautiful Japanese anemone. Flowers can speak more than words. 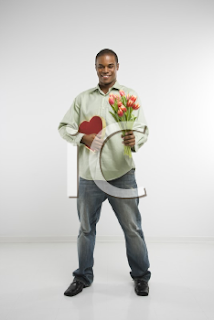 Today's Floral Friday photo shows a man presenting a bouquet of beautiful asters to a happy young woman. 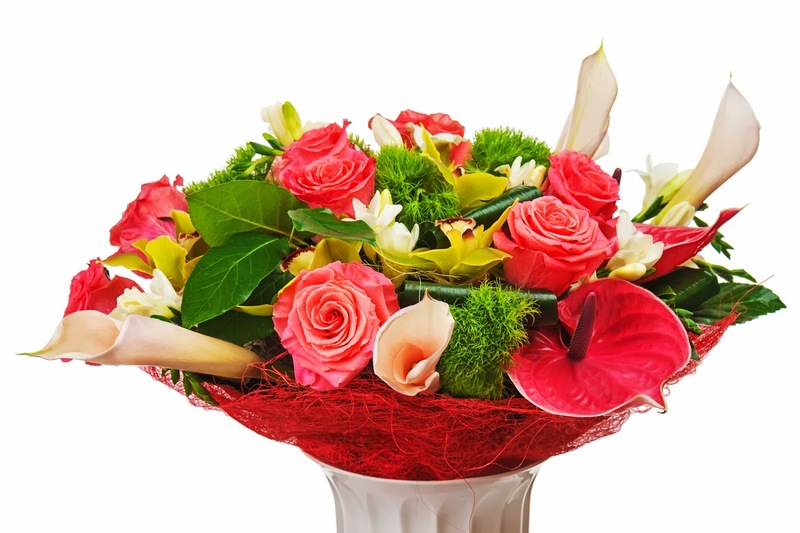 Today's Floral Friday photograph is of a beautiful mixed arrangement with roses and calla lilies. Such a nice way to brighten a fall day. In a season where blooms don't often happen, there's one plant that brings colour to our homes each winter. 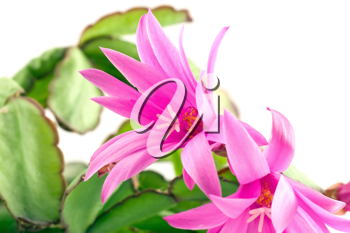 Is your Christmas cactus blooming yet? With trees stripped of leaves, and flowerbeds wilted here, beautiful flowers this time of year are native to warmer, tropical climates. Today's photo subject, a lovely frangipani, holds many meanings in many different cultures, from death to romance. As Monday is Remembrance Day, the poppy is the choice for this week's Floral Friday photo. 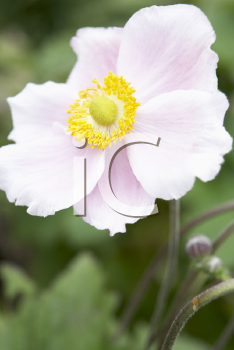 We selected a beautiful image of a field of these lovely blooms which hold such important significance. Today's Floral Friday photo gives us one last look at an autumn favourite before the snow flies — beautiful mums and a pumpkin. Autumn in our part of the world has taken a strange turn these days. As of this writing there is a robin on the lawn wandering the spots not covered by the light snowfall we've experienced. The gorgeous beginning to fall has kept many summer flowers in full bloom. And while many trees have changed to the beautiful crimsons and golds we expect to see this time of year, there are still many others sporting full green foliage. So, just for fun this Floral Friday as we seem to be seeing all four seasons at once, here's a lovely collage photo. Today we keep it simple with a photo of nature's sunniest flower — a single daisy. As this weekend, folks in Canada will be celebrating their Thanksgiving. 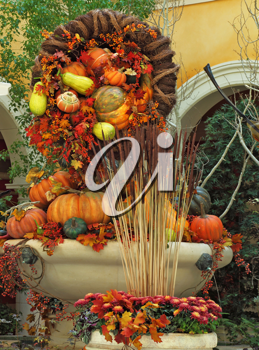 To celebrate the occasion the subject of today's flower photo is an impressive harvest display in a hotel lobby. In keeping with the fact that today is National Taco Day, our Floral Friday offering is this adorable photo of a chihuahua holding a rose. 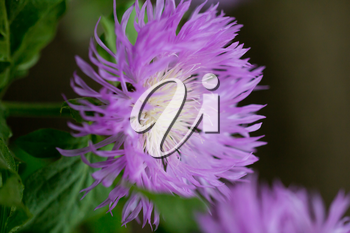 Today's photo is of a beautiful aster, September's birth flower. Its meaning is love, faith and wisdom. It symbolizes valour. As summer gardens begin to fade there's still a way to bring colour to your landscape. 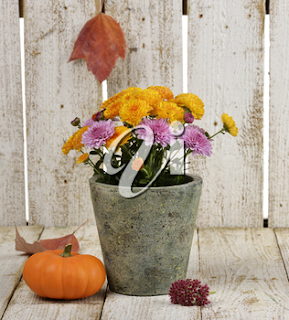 With their autumn hues, mums' are a traditional season favourite for outdoor fall decorating. 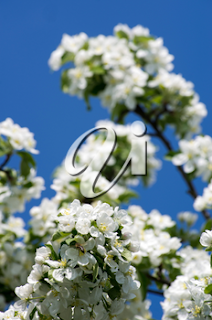 Wandering around the markets this time of year year is a treat as these vibrant blossoms bloom in profusion. From simple yellow and white to the deep russets and crimsons, they warm the cooling days. 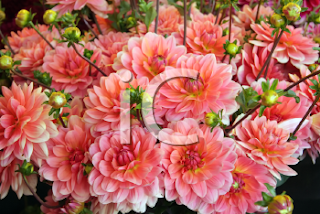 So for this Floral Friday we offer a photo of a beautiful bouquet of chrysanthemums. 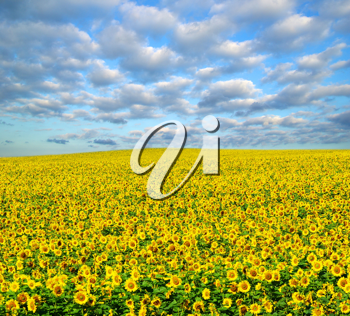 It's quite likely these days that a drive in the country will mean spying a crop of sunflowers – as well as the lineup of cars with exiting passengers eager to photograph them. Little wonder, I suppose, In a field, these statuesque late bloomers do put on quite a show. We feature them in today's #FloralFriday photo. 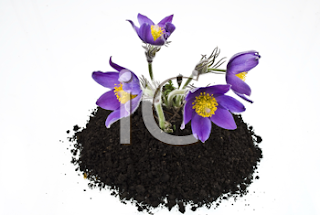 Flower gardens these days are not just about beds and potted plants. A beautifully landscaped garden contains many elements, such as textures and levels. The addition of a pond is just one more and with that comes the introduction of a completely different type of flower — one more commonly found rooted in water than in soil. 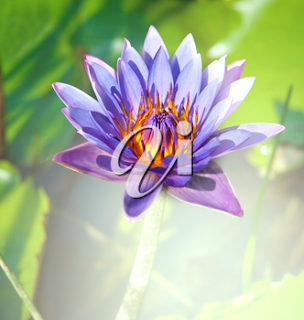 For this #FloralFriday we offer this beautiful photo of a lotus as an example. 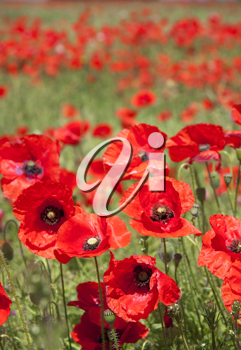 August's birth flower symbolizes strength of character; its meaning is sincerity. I sincerely hope that you like today photo of a lovely pink gladiolus on a vintage background, with space for text. For me there have always been certain flowers that almost seem to have a personality. For example, the daisy is such a bright and sunny bloom that if flowers can be happy you know the daisy is as cheerful as they come. The pansy, on the other hand brings to mind for me a mischievous child, full of colour and vitality. And in my case, as I've never successfully grown any in flowerbeds or pots, a little hard to manage. 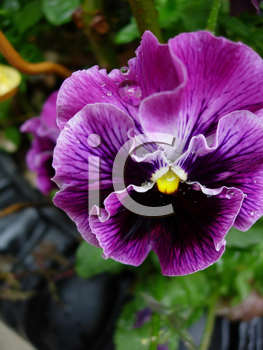 Perhaps you too can see some of that personality in this photograph of a perky purple pansy. Dreary and dripping is all I can see looking out the window today. Today's photo therefore, was chosen to reflect both the damp weather and the fact that even rain can be beautiful. 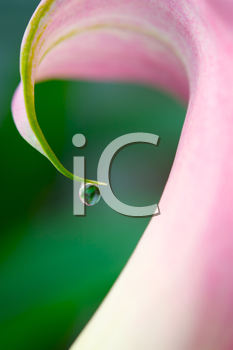 Here's a lovely closeup of a droplet glistening off the tip of a soft pink petal. 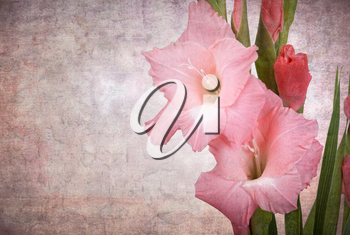 There are many garden flowers that make a statement — the lovely rose, the lush hydrangea, the majestic gladiola. 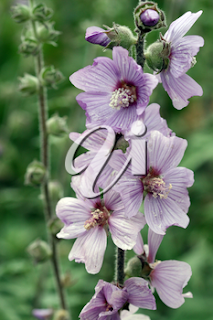 With its showy blooms and stately bearing, the hollyhock, featured in this week's flower photo is is certainly among them. 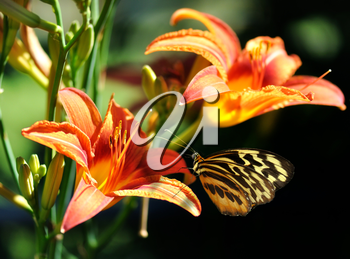 Diverse and hardy, so much so that even I can't kill them, the lovely lily graces gardens and roadsides. While the addition of many shade trees on our property has decreased their presence, they once beautified my flowerbeds in abundance with their vibrant shades of crimson, yellow and orange. The latter shade is featured in this pretty picture of lilies and a butterfly. 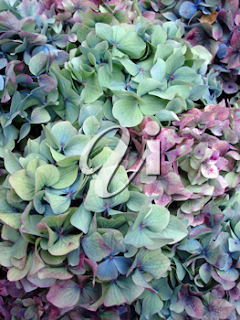 This week's photo is of one of my favourites — the lush hydrangea. I became besotted with these gorgeous blooms during a visit to wine country many years ago. This lovely closeup shows the variations of colours that make this such a popular choice for gardeners. Not just beautiful on their own, the colour, shape and lushness of flowers attract a variety of insects and animals to gardens. From the beautiful floating butterfly to the squat unattractive toad, fauna comes to flora for sustenance, rest and cover. Today's lovely photograph of hummingbirds and flowers offers the best of this summertime reality. 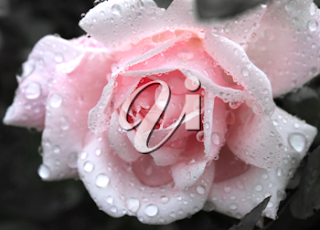 As we enter the final week of June we take the opportunity here to post one more lovely photo of the month's birth flower — this time a soft-pink rose with water droplets. Who could ever get sick of roses? Trusting that that's an impossibility the featured photo for the third week in a row is of June's birth flower — this time a gorgeous rosebush with blooms so lush you can almost smell the heady fragrance. 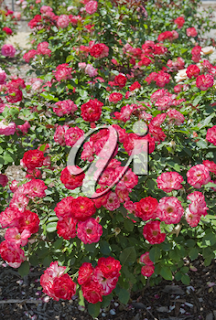 As mentioned last week, the birth flower for the month of June is the rose. With so many varieties and shades it should be easy to find a different one for each post this month. The lovely butter-soft yellow of this one caught my eye for today's offering. 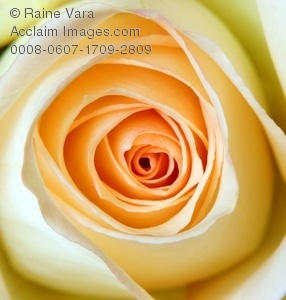 The birth flower for this month is the lovely rose. June is also traditionally bridal month so today's photo combines both — a closeup of a beautiful bouquet with the happy couple in the background. With these trees bearing different varieties of one of our favourite harvest fruits, their spring blooms can be found from early spring until June. 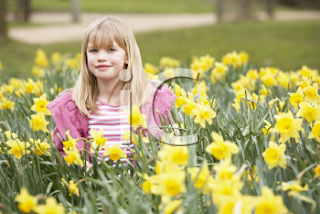 With their days soon over however, we offer a final look of apple blossom time with this lovely photo. This past weekend was spent catching up on some much needed gardening. 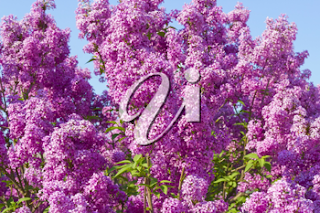 So intent was I on the task that it took me a second before noticing that one of my favourite flowering bushes was blooming — just like the lovely lilac in this week's photo. Looking for a photo for today's flower blog, I was drawn to this fragile beauty — a lovely white orchid on a soft pink background. Sweetness and humility is the meaning of May's dainty birth flower — lily of the valley. 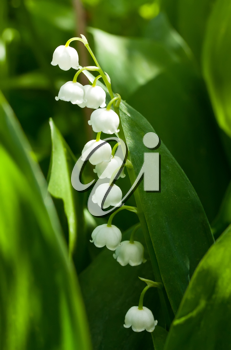 Today's photo is a close up these delicate white 'bells' against a verdant background. The only thing prettier than a single flower is a profusion of them. Some, like the simple bluebell, may not have the impact of an elegant rose or lush hydrangea, but a group of them together transforms a landscape. 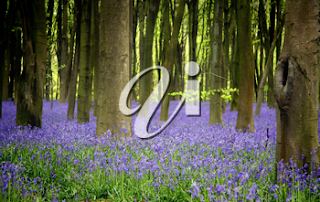 This photo of bluebells in an English forest is one of my favourites. They were my first favourite flower, perhaps because they are among the earliest to bloom as the weather warms. 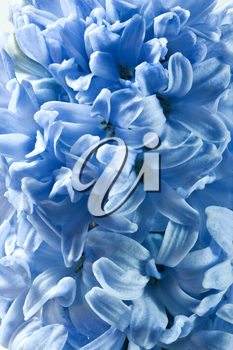 So what could be a more lovely choice for this week's photo flower than a closeup of a gorgeous blue hyacinth? 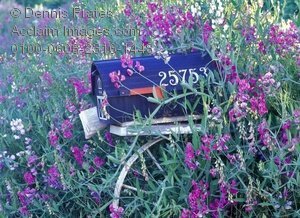 This week's photo shows some lovely sweet peas surrounding a rural mailbox. The sweet pea, such a soft and lovely flower to represent the the month of April. Like the feeling we have for the warming season of spring, this month's birth flower means blissful pleasure. Another meaning is goodbye, also perfect as we bid farewell to cold and snow. One of my dearest memories from childhood is my grandmother's garden. Bordered by a charming white picket fence, this horticultural heaven was home to every hue and variety one could imagine. With walkways and green spaces it was an enchanted play place for my cousin and myself. 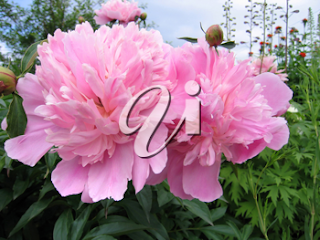 As we entered the gate one of the first fragrances to greet us was that of the peony. To this day, I can never smell its heady fragrance without thinking of Grandma and those wonderful times in her garden. Today's photo shows these aromatic beauties in full bloom. Hans Christian Andersen once said, "Just living is not enough. One must have sunshine, freedom, and a flower." 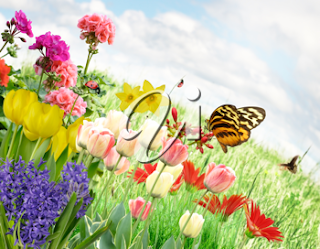 This beautiful photo of a butterfly flitting through a field of spring flowers, has it all. 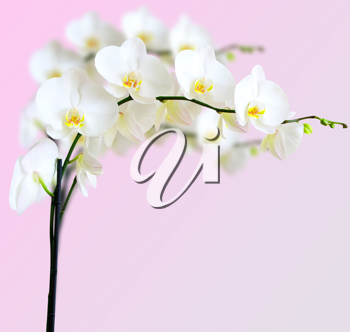 Flowers speak to people on a variety of levels. There is the romantic rose, the simple, but cheerful daisy and the impressive hydrangea. 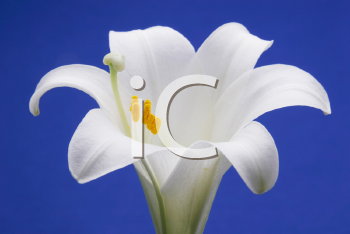 But there is probably no other flower that implies purity and virtue like the Easter lily. This beautiful bloom is significant in the Christian faith, as a symbol of the resurrection of Jesus Christ and eternal life. Today's photo of a lovely lily is perfect as we enter Holy Week. It may be cold, there may be snow, but officially spring arrives this week. 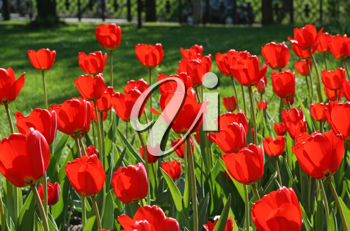 You can get an early glimpse of it with this photo of beautiful red tulips. It's not exactly a flower, but considering we will be celebrating Saint Patrick's Day in seven days, it seemed fitting that this week's photo should recognize this fun occasion. So, here's a lovely young colleen with a shamrock to bring out the Irish in you. 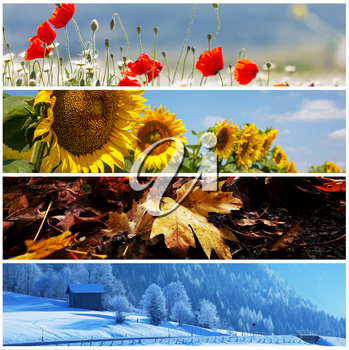 The snow may still be on the ground where you live, but it won't be long before spring is here. Now in our first week of March we celebrate one of the season's early blooms, which is also this month's birth flower. What better way to show off the vibrant daffodil than with a little girl sitting amidst a garden of them? With the days getting longer and the temperatures just a tad warmer, it's easy to believe that spring will soon be here. 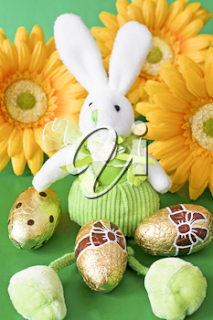 And shortly after the equinox is Easter. Knowing that it will arrive faster than a bunny hop, I couldn't resist this charming photo of a stuffed rabbit and wrapped chocolate eggs posed before some beautiful yellow daisies. With Valentine's Day being celebrated this Thursday it seemed appropriate that our weekly flower photo should play into the theme. 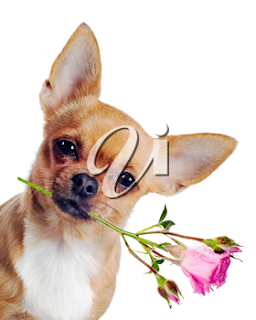 After all, nothing says "Be My Valentine" more than hearts and flowers, especially when the heart contains chocolate and the flowers are a beautiful bouquet. 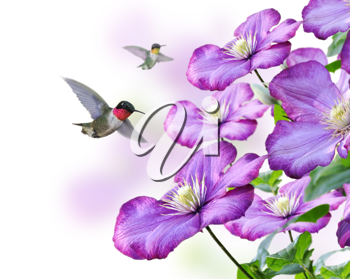 Symbolizing faithfulness, humility and chastity, the violet is the birth flower for the month of February. Made popular in Victorian times the intent when given by a man to his love was that he would always be true. While it comes in a variety of colour, mauve and purple are most in keeping with the birthstone for the month, the amethyst. We give you some of these pretty flowers with this week's photo. 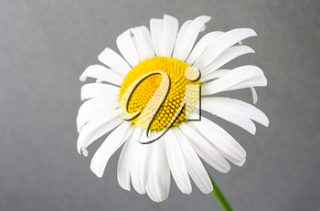 For the featured flower photo this week, I decided to take an example from iCLIPART.com's New This Month category. 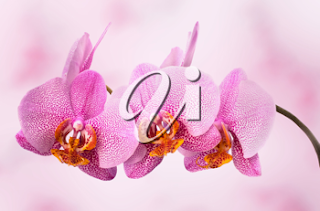 The beauty of the tropics comes to winter in this lovely photo of an exotic orchid on a petal-pink background. Flowers don't just brighten our world, indoors and out, they convey a number of messages and meanings. The one of love and romance may be the most familiar, but when it comes to saying "Please forgive me," nothing delivers the message better than a beautiful bouquet. We tend to think of them as the perfect flower for your boutonniere, but did you know that the carnation also happens to be the flower for this month? 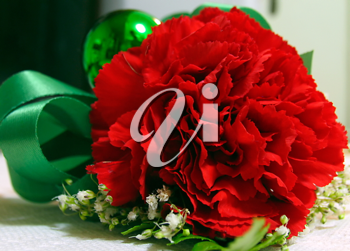 According to Birthday Gems the general meaning of the January birth flower is love, fascination and distinction. 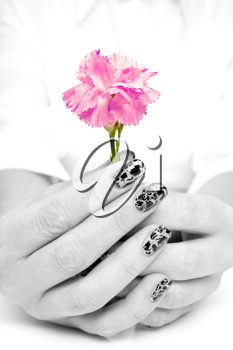 So here is a fascinating black and white closeup of a woman's hands holding a distinct pink carnation that you're sure to love.